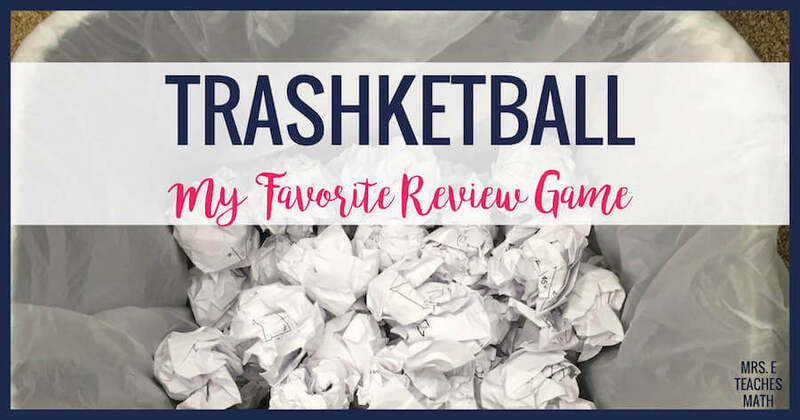 I like to use games to review skills because they’re SO much better than worksheets. Kids whine about worksheets, but put those same problems in a game and suddenly the whining disappears. I thought I’d share a list of awesome math games. 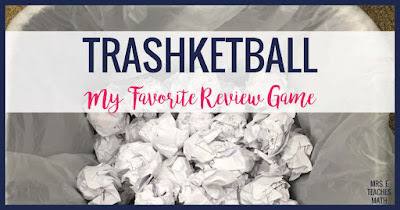 Trashketball - So if you haven’t read my post about Trashketball, you need to. 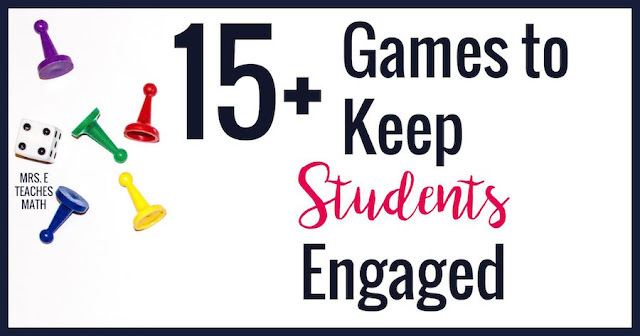 It’s pretty much the BEST review game I’ve ever played - as a teacher or as a student. I have former students that are now in college STILL talking about this game. It gets kids to do lots of practice problems and involves throwing things. Need I say more? Which is Largest? - Which is Largest? is a newer game that I’ve created. Students get a group of problems and they put the answers in order from greatest to least. You can totally ham it up game show style. I have a microphone that I use when I play this game. #NoShame One of the things that I like is that students get practice ordering numbers on the number line while also practicing another skill. 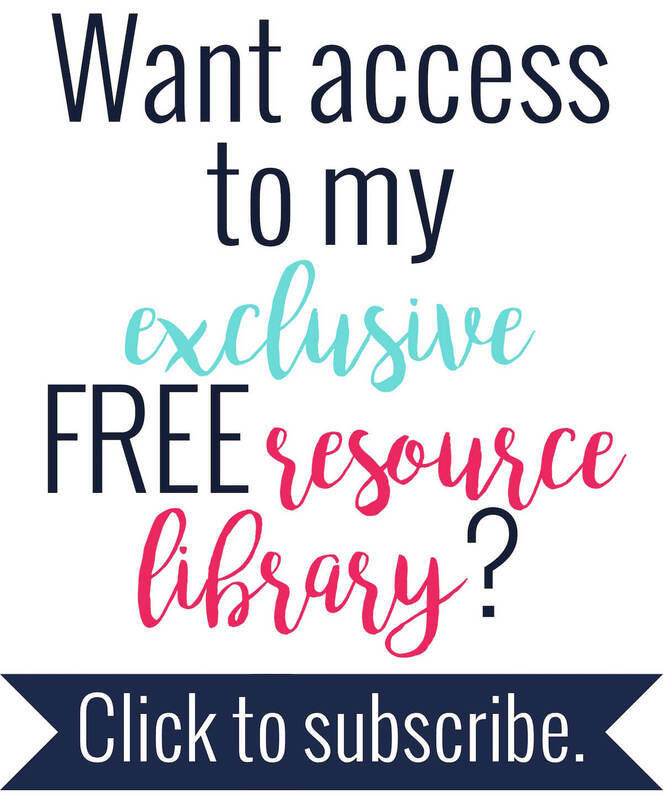 For Pre-Algebra and Algebra 1 students, this practice is SO necessary! This can become more challenging if answers are fractions, decimals, and integers. Old Math Guy - Free to Discover has a whole line of games called Old Math Guy. They are very similar to Old Maid and get students to practice math skills in order to match the cards. She posted on her blog about how she used this game to motivate inner-city kids as a math interventionist. An added bonus: the drawings of the Old Math Guy are pretty funny. Dang it! - Jameson from Lessons with Coffee created a game called Dang it!, which is similar to Zap! This particular game practices converting fractions, decimals, and percents, but this idea could be used to practice various topics. Grudgeball - Grudgeball is a twist on Jeopardy. Basically, students can steal points from other teams in order to win. The nice twist on this game is that the team with the “smart” kids isn’t always going to win! Bingo - Yes, I’m including bingo on this list. Bingo played the traditional way is kind of lame. It’s overdone and let’s be real: kids aren’t very excited to play it. HOWEVER, Scaffolded Math and Science has a cool twist to this game. This solving equations bingo game makes bingo un-lame. There are spinners where kids make their own equations, then they color the corresponding answer on their bingo card. I also like that this can be played individually or in small groups. I think small groups makes this much more engaging than whole class bingo, because students can work at their own pace...and I always liked playing with spinners as a student. Tic Tac Toe - Students can use task cards to play tic tac toe. If they get their question correct, they can take their turn. If they are incorrect, they lose their turn. Not super special, but if you play it on whiteboards, students are way more excited. Connect Four - You can play Connect Four using task cards. Students “draw” a task card, complete the problem on the card, then take their turn. If you want to play with your whole class and don’t have enough sets of games, then the Connect Four games by Alex O’Connor the Middle School Math Man may be a good option. He has paper versions of the game for various middle school math skills. Amazon has some inexpensive Connect Four games if you want to play the real thing. “I Have… Who Has…” - Typically, “I Have…, Who Has…” doesn’t have a winner. “I Have…, Who Has…” is really just a set of cards like dominos, where students link the cards together. However, I never play it that way. I always group my students into three or four teams and give them a deck of cards. Then I have them race to see which team can put them in order fastest. Another version of this is to set a timer and see which team got the furthest in the set amount of time. Taboo - Taboo could be so much fun to practice vocabulary! It would take quite a bit of prep work to create, but is something that could be re-used year after year. There are a couple sets of cards already out there on The Roots of the Equation and Mr. Collins Mathematics Blog. Conquest - Conquest is similar to Risk. In order to attack their opponent, students must answer math questions. Correct answers let them advance on the map, while incorrect answers lose the battle. Pictionary - Pictionary is a great way to practice graphing! 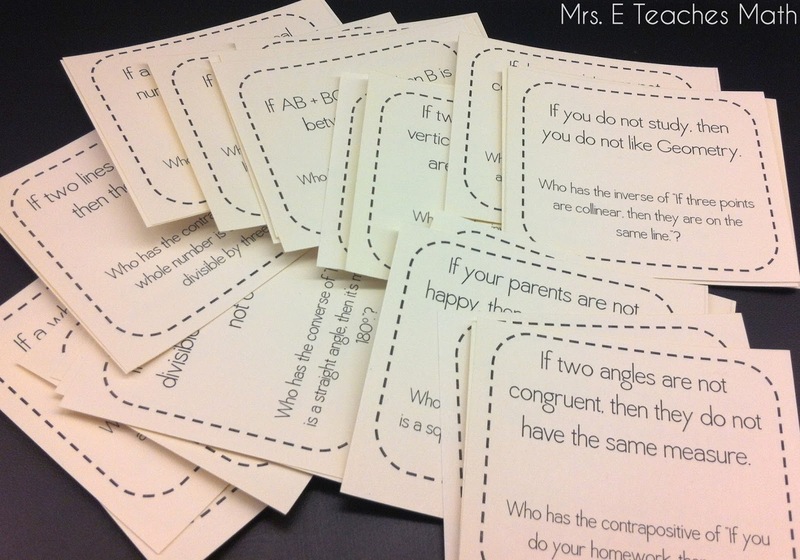 Students could be given equations on cards, then have to graph it. Students could also be given characteristics of graphs and the kids guessing could have to shout out the equation. Scaffolded Math and Science has an interesting twist on Pictionary for helping kids practice graphing absolute value, radical, and quadratic functions. Kahoot! - Have you played Kahoot? 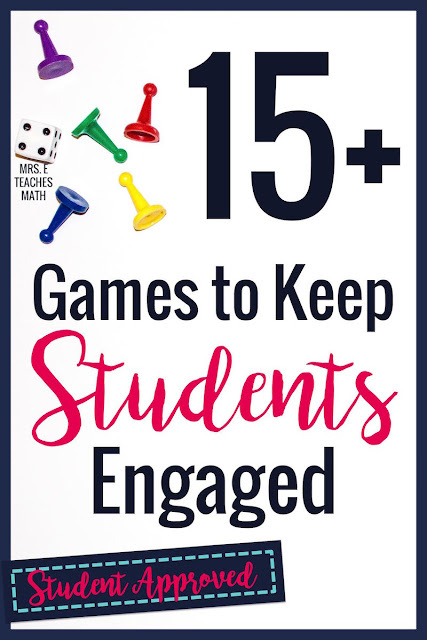 This is the one game on my list that does require each student to have some sort of technology (phone, ipad, laptop, etc). Kahoot! is a review game where kids race against each other to answer multiple choice questions. It’s super fun, but I wouldn’t recommend it for classes with a wide variety of ability levels. 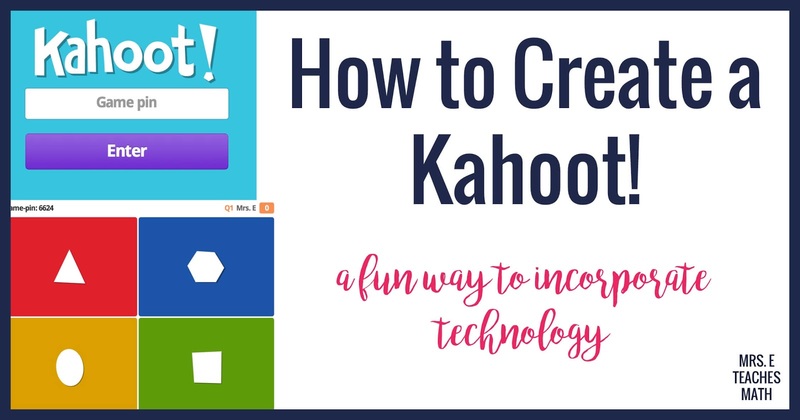 Check out my tutorial for Kahoot! Battleship - I think everyone has played Battleship at least once in their childhood. All Things Algebra has a fun twist on Battleship that gets students to practice different math skills. This game has students practice factoring. In this game, students factor quadratics in order to sink their opponent's battleships. Poker Chip Game - This game is super low prep, but does require poker chips. Students answer multiple choice questions and have to “bet” if they are right or not. Students are practicing, and you also get to see their confidence level with the material. This game starts lots of good conversations and also helps kids practice answering multiple choice questions. These inexpensive Poker Chips would be perfect to play with. Since they're inexpensive, you wouldn't have to worry about them getting lost. Hot Seat - In this game, students sit in rows and the first person in each row is in the "hot seat". The person in the hot seat has the opportunity to earn the most points for their team. You can find more details and a scientific notation game here. What games do you like to play in your class? Thank you so much for including my spinner game in your list! I remember reading a post you wrote about Kahoot and introducing it to my co-teacher at the time. Before I knew it, the entire math department at my school was playing Kahoot and the site started acting funny. We all joked that we :broke Kahoot" because everyone was playing it! Later we learned that our internet was being hacked, but it see,ed really likely that we had in fact broken Kahoot!! My students love to play Jinga. I bought a cheap knock off version. On each block, I wrote a number that is the point value. Students are split into two teams. All students complete the problems on a sheet of paper, but the two going head to head do the given problem on a white board. The winner gets to pull out a block and gets the points written on that block. We follow the basic Jinga rules for dealing with the tower. The winner is the team with the most points or the one that doesn't knock the tower down. My students beg to play it. I also do a variation of The Price is Right where students work on a practice sheet or use problems from homework. Five go to the board and put their answers up while the contestant waits in the hall. I make sure there are some with mistakes. The contestant comes in, I tell them how many have mistakes but not which ones. The contestant needs to find and correct the mistakes to win a small prize. I only do 1 or 2 rounds per class, but I keep track so that everyone gets to be a contestant within a grading period.